The elevated trains in Chicago are both great and terrible. You can watch them come and go as you walk up to the stations that rattle a story above ground. It's a way to witness the motion of the city – traveling, transportation, energy, innovation, synergy! On the other hand, it means that each morning as I walk up to my station, I can watch my train arriving from a block away. I made the train that morning! Since moving to Chicago, I've found myself rationing bath products. 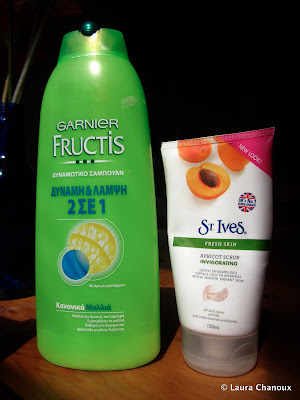 I've been buying new shampoo and soap, but I can't quite seem to finish the bottle of Garnier Fructis shampoo/conditioner that I bought in Paros. I don't know whether it's for dry hair or added volume. The pictures on the label don't do much to explain the Greek beyond indicating that it's for your hair and should be used with water. Still, it sits on the edge of my tub and I can't throw it away. All I really understood was "two in one."